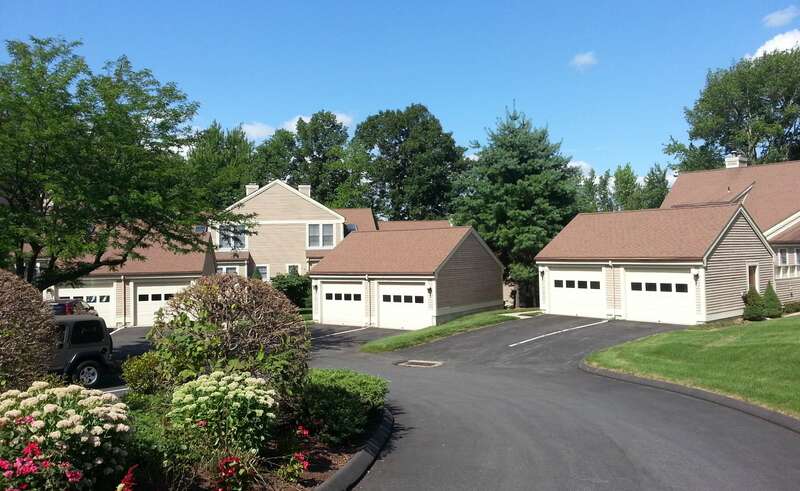 Sterling Woods on Logging Trail Road is a complex of stand alone colonial style townhouses in Danbury, CT. Built in 1998, the three bedroom, three and one half bathroom units range from 2,000 to 2,330 square feet. There is an open floor plan, with the corner family room having hardwood floors, crown moldings, and a fireplace. The living room is off the dining area and next to the eat-in kitchen. With sliding doors that lead to the beautiful all weather deck, you'll have beautiful views of the hills and open spaces. Kitchens also boast tile floors, custom cherry cabinets, top of the line appliances, and recessed lighting. Dining rooms feature wainscoting and easy care hardwood floors. The master suite ensures plenty of light with gorgeous windows and vaulted ceilings. The marble floored master bath has granite topped vanities and extra large showers with soaking tub. Sterling Woods is heated with gas and cooled by central air conditioning. Storage is not a problem with a full walk out basement and a two car attached garage. There is also a security system and central vacuum system in place.